In an ever-changing and fast-paced world, the Youth x Hub welcomes Youth from all walks of life, aged between 15 and 35 - whether students, employees or entrepreneurs. The Hub will be the platform to connect Youth to each other, bounce thoughts back and forth, and launch-spring their ideas. While our world is changing exponentially with new technologies and scientific advances, we believe society’s response to them is stunted by embracing the myth that Youth are a problem and lack the capacity to lead effectively. It poses a great threat to our security and prosperity. If we simply flip our lens to view Youth as a premier asset class or as energy to harness, IMAGINE how much more we, as a global community, would be adept in solving the greatest social and systemic challenges of our time. 60% of the population in the Middle East and North Africa region are between ages 15-35. They are educated, energetic, and diverse. They are hungry for jobs, for community and for opportunity to actualize their purpose as human beings. Part of this purpose must be attained through meaningful employment. The other, through connection. To others in activities of significance - and to themselves. With the fast-changing global economy and our systems on the brink of major development and disruption, we don’t have the time to wait for young leaders to turn 40! We must empower and engage them now. Youth have the raw materials, fresh ideas, and moldable talents to usher in the innovations and creative solutions to the challenges that they and our societies face every day - and those future generations will also face. So HOW did we find the people and connect their ideas? The chief belief of the the UAE leadership and Ministry of Youth is that Young people can design solutions to our greatest challenges. The first challenge was creating a central forum for Youth to connect and share their ideas. We made an intentional and assertive push to reach Emirati Youth across all 7 Emirates and around the world. We made an intentional and assertive push to reach Emirati Youth across all 7 Emirates and around the world. So we went first where Youth is live online. We posted invitations for their ideas via Instagram, Twitter, Snapchat, and Facebook. We sent emails through university listserves. Then the newspapers pitched in and sent out invitations for Youth to contribute their ideas for how the UAE must move forward. In the first two weeks, we heard from over 2,000 Youth across all 7 Emirates. 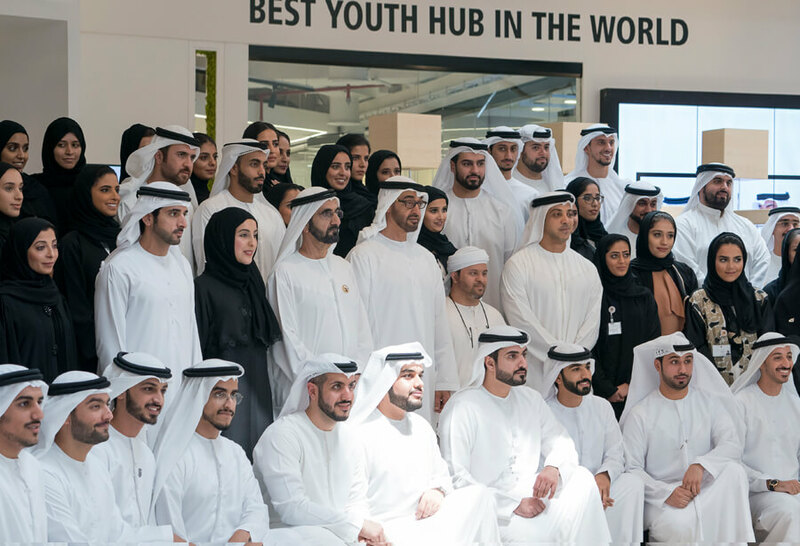 Newspapers were so impressed with Youth response that they posted replies to their ads and prompted interviews with Youth to further explore their ideas and insights on participating in the UAE’s “Powered By Youth” model. Finally, we set up Youth Circles, our signature platform that creates a two-way dialogue between Youth and government. A Youth Circle is simple, really; it involves us listening. Listening skillfully to Youth. Then we come up with transparent outcomes from the discussions. Out of these discussions with Youth came the idea for the Youth xHub, our first major initiative. It’s easy to collect ideas; however, it’s more of an art to translate ideas into meaningful outcomes. Our process was simple and focused. We collected every message Youth sent us from calls, emails, social media, newspapers and Youth Circles. Then, we divided them into categories and tracked similarities. Immediately, a glaring trend stood out: Everyone wanted a coworking space. And everyone wanted continuous learning beyond the university. This was a powerful revelation: Youth want to learn year round AND they want to do it together! X marks a spot, multiplies numbers, and defines a generation. X represents the Roman numeral 10 and also wins 10 points on the Scrabble board. It is one of the least-utilized letters in the alphabet, the most utilized letter in science and mathematics, and the rays across the greater electromagnetic spectrum that allow us to see inside the body without making an incision. X marks a spot, multiplies numbers, and defines a generation. X represents the Roman numeral 10 and also wins 10 points on the Scrabble board. It is one of the least-utilized letters in the alphabet, the most utilized letter in science and mathematics, and the rays across the greater electromagnetic spectrum that allow us to see inside the body without making an incision. X is polymathic. X is versatile. If you took Algebra in school, you were introduced to X - the most commonly used universal variable that represents the essential factor to solving a problem. X + 10 = Y. X is the mystery ingredient. X points us to a solution. X originates back to the Arabic word “شيئاً” which means "the unknown thing". Our Arabian founding fathers set in motion one of the most dynamic characters shared among languages. X is legacy. X is potential. The Pod (B) The Pod fits 2 Youth, 2,000,000 Ideas, 2 Smiles, 2 Good Hearts, 1 shared value of honesty, 20,000 seconds of Purpose-Focused Thinking, 200 minutes of Deep Sustained Reflection and 2hrs of Soundproof Analysis. A Meeting Room for Youthful Pioneers in different Fields to discuss innovative ideas, to overcome complex challenges or to pioneer in a sector. The Field is the room where teams huddle together to map the visions and to motivate one another and set strategy to play, fight or perform. Solutions, Answers, Aims and Targets require a Field where all are connected with their mind and thoughts. What counts is not what we do in planning or practice, but how we perform on the field. A Space for more focused and smaller team meetings to study or work. The Hive gives youth an opportunity to have follow up meetings on the progress of projects, ideation or studies. Book The Hive meetings, order equipment and register for programs on our website. After completing the booking, please contact the team on hub.info@youth.gov.ae with the details of the events. Thanks, your booking has been done successfully. A sound proof space that provides advanced technology for photography, videography, directing, production and working on different media projects. The studio offers training and mentoring services by specialists. Lost is the tradition of artists’ convening in salons to create together. In Youth xHub, we want to revive the experience of young people painting, drawing, sculpting and designing together. The Canvas is a glass room with Youth painting; a calm, clean and creative shared studio where life is art and art comes to life. We seek to capture the creative energy of the artist quarters with modern amenities for new creations and connections; We are a Maker Space for art in every form. What Youth create here today can become the fabric of our city, our country and world tomorrow. A blank canvas carries great potential. Come recreate and re-create what you came to do. Plato said we can learn more about someone in one hour of play than in one year of work. When humans play, we release our brains to release our stresses and tap into the millions of its data files that unleashed our creative potential. And we don’t even have to try. Play connects us to ourselves and one another. It makes us look at things differently than we did before. Play builds confidence, trust and perseverance. Play is contagious. At Youth xHub, play is a vital part of our work. Powered by Youth, ReCreation offers the container for the play that makes us most creative. Take a pause from class, co-working or pitching to come play in ways to fuels your deepest curiosity. Play unlocks the seeds of innovation. Change is the certainty of the 21st century. With our feet in the present and our eyes on the future, The Lab is the YouthXHub’s catalyst room to equip Youth to bring new solutions to old challenges. Our state of the art lab space provides Youth with the opportunity to solve real organization challenges and gives top organizations’ a chance to recruit talent. Youth disrupt and revision products, services or businesses and make them better -- more innovative, efficient and scalable. Gain a real-world insight into a company or industry and let them see your skills and ideas shine. We must disrupt, or be disrupted. The Pod fits 2 Youth, 2,000,000 Ideas, 2 Smiles, 2 Good Hearts, 1 shared value of honesty, 20,000 seconds of Purpose-Focused Thinking, 200 minutes of Deep Sustained Reflection and 2hrs of Soundproof Analysis. Successfully applied for the event. A confirmation link has been sent to your email. Please click on the confirm link to complete registration. So come, learn in our Academy, read in our Library, pitch in our Lounge, collaborate and create in our co-working space. Then tell us about your experience in a Youth Circle or online. Tell us what’s working for you and how we can make it better. Tell us YOUR IDEAS for how Youth can lead the UAE and our world successfully into the 21st century. Come be part of the new network of YOUNG creatives, innovators and entrepreneurs. Together, we will create the future. Two (2) hours free parking at the Boulevard, underground parking.